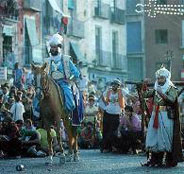 Twenty-two companies, eleven Moorish and eleven Christian, are the authentic protagonists of these festivities. The representations of the landings, the Blunderbuss battles, the Christian victory and the Moorish defeat, manifested in the symbolic retreat of moors to the sea, are the most characteristic acts of the festivities. In Villajoyosa, the Moors and Christians festival pays homage to Santa Marta. National tourist interest, declared an international tourist interest. Días 25 y 29, fiesta laboral local.